The Alaskan tundra wolf resides in the tundra regions along the Arctic coast of northern Alaska. 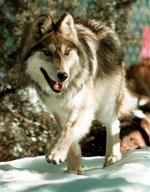 The Alaskan tundra wolf is a large wolf measuring from 50 to 64 in length (nose to end of tail). Its weight can vary in males from 85 to 176 pounds, and in females from 80 to 120 pounds. 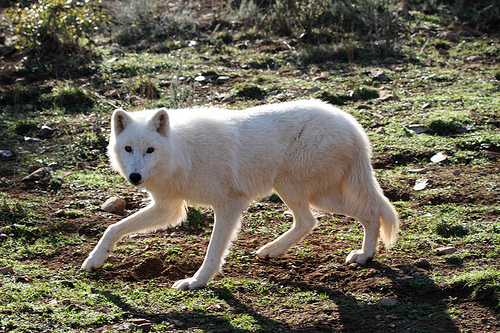 They are usually seen in light colored to pure white coats, though they also come in dark coats, including black. 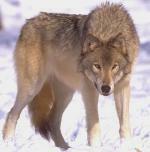 Their hair is long, though not as long as the European Tundra Wolf. They have a heavier dentition than the Interior Alaskan Wolf. When possible, it will feed on deer and other ungulates. It also feeds on smaller animals and vegetation. The dominant male and female of the pack will mate around February. Gestation lasts anywhere from 62 to 75 days. The female usually gives birth to about 4 pups in a den. The pack will assist in raising them.